Remington Traditional School connected its learners to the Winter Olympic games in Pyeongchang, South Korea, by holding its own Olympic Torch Relay - with a literary twist. The Remington Literacy Team dreamed up the idea of celebrating the Olympic games through literacy by passing the “reading torch” for the duration of the real games. Students emulated the passing of the Olympic Torch by passing reading time from one student to another. A comfy chair was placed in the school office for a reader to sit and enjoy a book of their choice for a pre-scheduled time of 15 minutes. The student read until the next student arrived to read in the chair, then passed “the reading torch” (a giant blow-up torch the staff obtained) to the next reader. 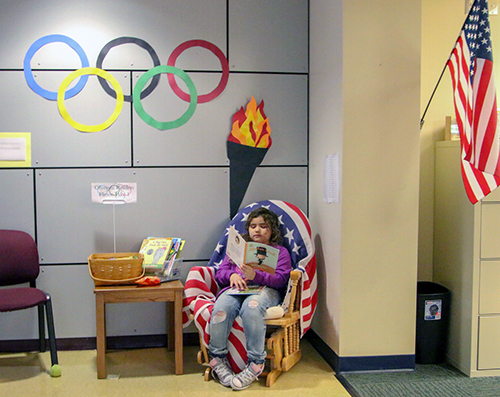 Students also received a medal to wear around their necks, and the reading nook was decked out in Olympic decor. The relay began on Feb. 9 to coincide with the opening of the Olympic games and continued until Feb. 23 while classes were in session.